A couple of weeks ago I started marathoning Battlestar Gallactica, which I had missed the first time around. When I saw "Dr. Cottle", as I usually do with that actor, I thought of Da Vinci's Inquest and how great he was on that show. A couple of days ago, I posted about what's being billed as "the first trangender comedy" which will take place "at the unfashionable bottom of the rabbit hole that is the East Vancouver Queer Underground" which again made me think of Da Vinci's Inquest (great show), so I started digging around Wikipedia and IMDB. 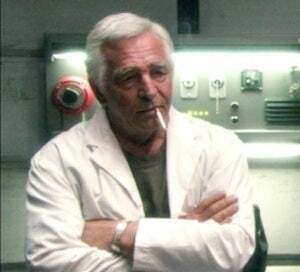 That is how I learned that Donnelly Rhodes, "Dr. Cottle" on the Battlestar Gallactica reboot and "Detective Leo Shannon" on Da Vinci's Inquest, also played "Dutch" on Soap. Unfortunately, I haven't been able to find a higher-quality embeddable clip, but even through all of video's problems, you can see it's him from this snippet of a Soap clip show.